Burns an African-American and Democrat also happens to be the pastor and founder of the Rising Sun First Baptist Church, which was one of the full-time petition drop-off and training centers for anti-gay-activists who want to overturn Maryland’s nascent gay marriage law that goes into effect in 2013 by putting the law on the November ballot, and giving voters a chance to overturn it. 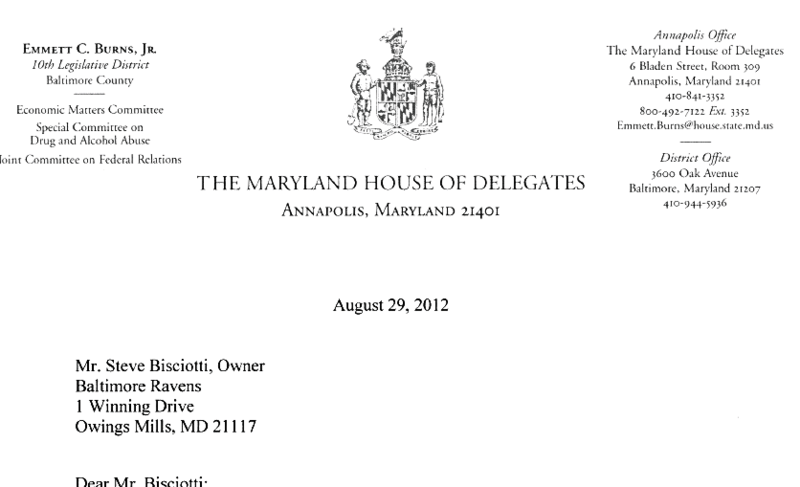 Not only is it appalling that a Maryland Democratic Delegate would write such a letter to the Baltimore Ravens demanding the tarts someones freedom of speech be taken away. Buts whats even more appalling is that Burns uses his church as an anti-gay training ground without suffering any political ramification from inside the Democratic party and the Maryland House of Delegates. That’s always been a fine line the Dems walk with many Black Democrat politicians. Many tend to be Pastors and Reverends and have many of the same ideologies as those of their religious right peers. However, the Democratic party absolutely can’t afford to lose the minority vote, so often these non-party line stances are allowed to pass without rebuke. Pastor Burns chastised President Obama back in May when Obama came out in support of gay marriage and offered to pray for him. Obama’s stance really stuck out knowing he would be challenged by many Blacks and Latinos in the party. I am a Maryland resident, and sadly we are all too familiar with our unfortunate Pastor Burns. The other sad truth in Maryland is that the state is so blue, you have many Democrats here who are more socially right than Republicans in other states, it’s just par for the course in our political landscape. I applaud the stance of Ayanbadejo who continually proves to our fans that he is a very thoughtful citizen and consistently pursues and supports agendas that personally feel right to him. It is sad that Pastor Burns feels free speech is something only allotted for agendas that meet his definition of what is right or wrong.